Click here to open a sample copy of this publication. Your Pilot Getaways Passport to Unlimited Adventure! 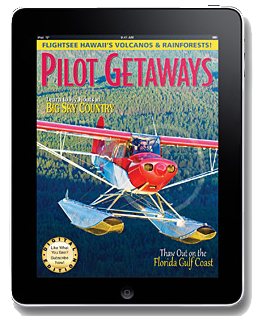 Now you can read every issue of Pilot Getaways ever published on your desktop computer, laptop, tablet, smartphone... virtually any web capable-device. Full archive to be available on our official launch scheduled for January 2019. You can also access the archive through the Pilot Getaways iPad App! Just sign up below, and we'll send you instructions on how to log-in to your account through the dedicated app. Enjoy free access to the American Air Campers Association database! *Renews at the standard rate of $49.95, January 2020.